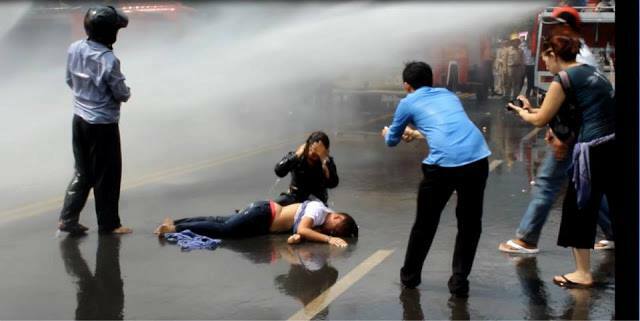 She fainted but the water canon kept on going. particular in the past two days. accountability to the safety of women and it must be condemned. 4,000 workers on strike for living wage, in Kompong Speu. To build a strong and skilled labor force for a fair and equitable economic growth, the Cambodia National Rescue government has the responsibility and duty to promote decent employment in safe working environment and ensure living wage for workers to support the safety and dignity of their families. 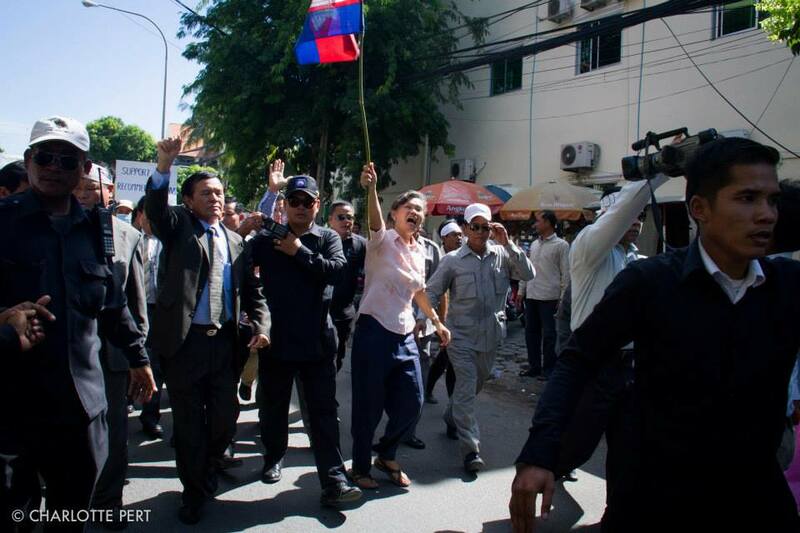 The students who stood up to challenge the integrity of the UN Rapporteur’s report on Cambodia human rights situaiton have their own right to express their views. It does not matter where they come from. It is up to us to take action and Nikki , in her own video did so, from her heart and her strong believe in where Cambodia should go. It is very encouraging that youths are going to social media to get information that is otherwise not available. Each click, each like or dislike is moving democracy forward when they trigger exchange of views and debates. let us imagine if there was total darkness. 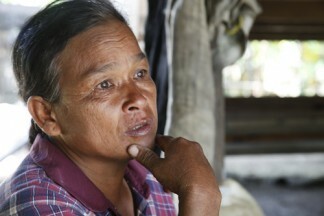 Thank you, Nikki for the tears and the pains and the hope for Cambodia. To the students of Mekong University, you made news. A young monk stood up to support the report. All that is asked for : respect for people’s views and let’s unite despite our differences. Our challenge: Making democracy work. Over 5,000 came. Many young from social media. The big brands going for cheap labor in Cambodia or elsewhere will always get away in these countries when justice is for sale and in the hands of those in power. As consumers, we can be on the side of workers to demand for justice for the 3 women who were injured. Boycott Puma and other international brands that do not sign up for economic justice. 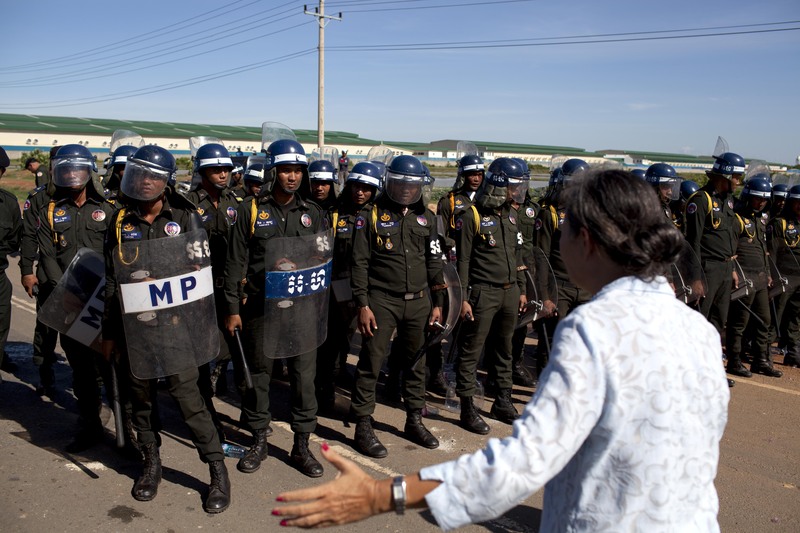 In recognition of women’s vital role in the rescue of the core Khmer values of mutual respect, compassion and justice; the CNRP is committed to ensuring the equality and security of all women to achieve progress in Cambodia. All establishments and work places must be set up to guarantee the safety of workers. •	protection from dangerous machines and apparatus. 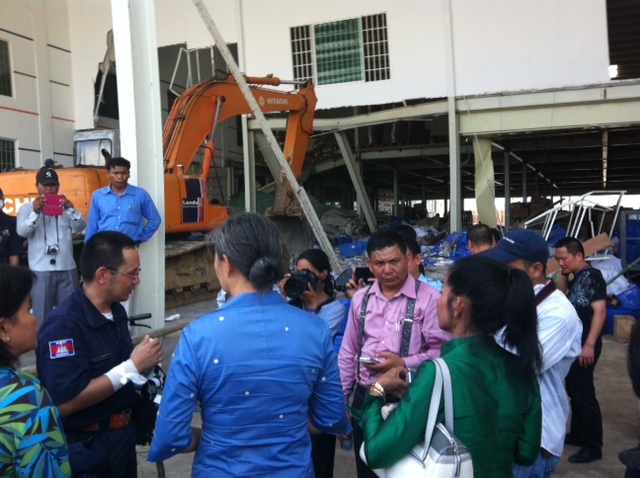 From eyewitnesses, a portion of the ceiling collapsed, crushing workers under steel and concrete. Labour inspectors and controllers should conduct inspections for the purpose of enforcement of the provisions I the law. Opposition MPs ask for report(s) of inspection(s). According to the governor of the province, the factory did not ask for a permit to construct this part of the factory that collapsed. Article: 249: Managers of enterprise are liable for all work-related accidents. We want to see full, independent and professional investigation with all details available to the public. A simple “compensation” of a few thousands dollars should not be accepted as a way to close the case as in many work related accidents and deaths. MPs letter will go out next Monday to the two ministries. Opposition MPs and trade union representatives will visit the workers Sunday 19 May at 8Am to inform them of the law and their rights.